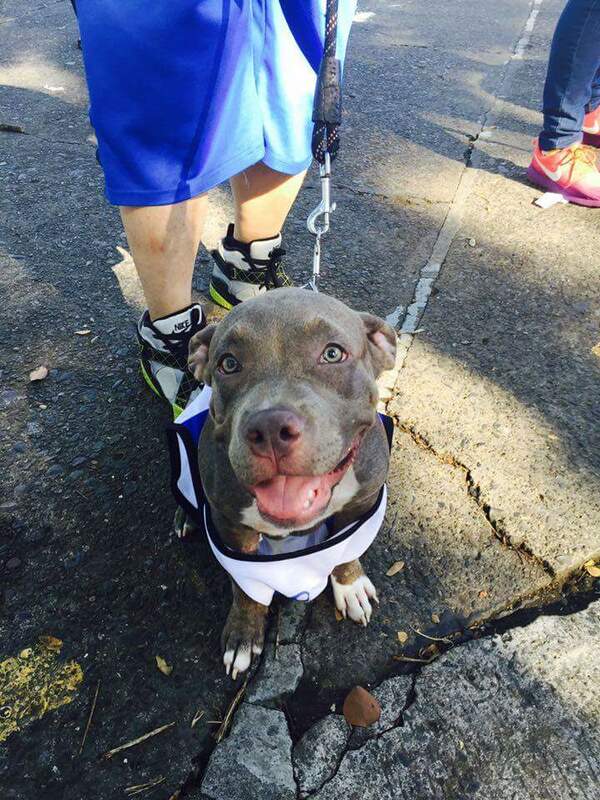 Woke up at 5 am this morning to bring Akuma, our American Bully/Pitbull Terrier to the I Run, I Give Care, I Give Life Event held at Ateneo De Manila University. This annual event is held by the Kythe Foundation to help underprivileged kids from pediatric cancer wards from all over Metro Manila. A friend asked us and a few others to bring over dogs for the children to play with. Akuma was such a trooper! He was so well behaved and he let the kids touch him all day and he played with nearly all the kids. He may look fearsome but he’s such a big baby especially with the kids. He ran in the final event, the 100 Meter kiddie dash together with the event beneficiaries with their Ates from Miriam College. Hopefully this erases some of the stigma associated with the Bully Breeds. The American Pit Bull Terrier and the Stafforshire Terrier have bad reputations and people are afraid of them because of the news reports of them being killers. Truth is these breeds were originally intended to watch over children. In fact, in some circles, they are called as nanny dogs because they are so good children. The reason? They were bred to have a high tolerance for pain. Children are really rough when it comes to dogs and you need a dog that can withstand that kind of roughhousing. However, through the years, unscrupulous owners and dog fighting aficionados discovered this unique feature and bred and trained some lines specifically for fighting in the dog pits. Cruelty and ill treatment led to violent dogs that do not trust humans and other dogs. That’s where you get the ill informed stereotype of the Pitbull – savage and out of control. It just goes to show you that it is never about the breed, almost always bad dogs are the result of bad owners. I would also like to highlight the importance of therapy dogs. Dogs ease the suffering of so many people afflicted with terminal illness and depression. Dogs have this natural ability to make people feel better. This may be because of our intertwined histories as they are the first animals we ever domesticated. We instinctively trust them and they instinctively trust us. Hopefully, in the future, there will be more events like this so we can help out people who need it the most. Awts. Sad to hear that. Hopefully great dogs like Akuma or Dhalsim will change your mind in this regard.